"Uniquely representing the best of the traditional and the new SoMa"
900 Folsom is a mixed use residential project with onsite affordable housing. 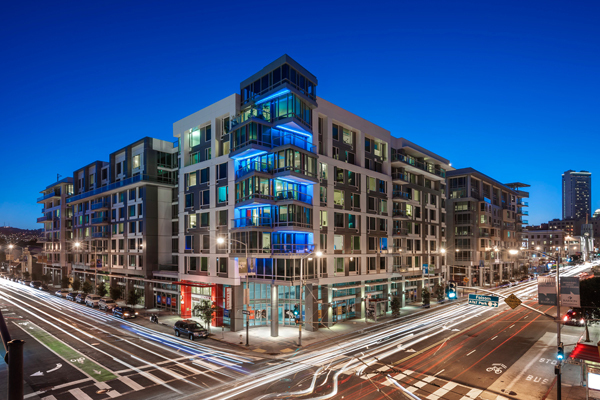 Avant transformed 56,000 sq ft surface parking lot into a transit oriented, LEED Gold development with 281 units of housing & approximately 5,000 square feet of neighborhood serving retail. The site is ideally located within walking distance to San Francisco's two employment centers which are comprised of traditional offices in the Financial District north of Market Street and creative brick and timber spaces in the South of Market District (SoMa). In its 3 years of design and community outreach, Avant conducted multiple public workshops to help it shape and concept these projects. With a focus on flexible Folsom street uses to ensure an active streetscape, pedestrian oriented sidewalks and alleyway design, a public pocket park, and residential unit types and amenities reflecting the diversity of central SoMa, 900 Folsom is uniquely represents the best of the traditional and the new SoMa.